General Cannabis Corp (OTCMKTS:CANN) continues its move higher after releasing its full-year 2015 and Q4 2015 results. The stock has almost doubled climbing from $0.46 to its current levels of $0.86 on increasing volume that far exceeds it daily average volume. The share price gained over 24% by market close. According to a recent 10-K filing, the company is operating in the marijuana industry that is expected to surpass $30 billion by 2020 and is one of the fastest growing industries in North America. General Cannabis Corp (OTCMKTS:CANN) reported its financial performance for the year and saw revenues grow over 600% to $1.76 million. For the fourth quarter, revenues climbed over 1,000% to $0.69 million which account for over 40% of its full year revenues. If this trend continues, revenues should easily eclipse $3 million for 2016 despite managements run rate of $2.75 million. The company announced a record breaking quarter and year in all divisions of its operating business. CANN expects to see continued organic growth through 2016. It is also has continued its aggressive acquisition strategy and opportunities that will benefit the company’s long-term success. CANN operates through four divisions: Security and Cash Management Services, Marketing and Products, Consulting and Advisory, and Financial and Real-estate. Security and Cash Management Services — In March 2015, it acquired Iron Protection Group (“IPG”), which provides advanced security and cash transportation services to licensed cannabis cultivators and retail shops. It intends to continue to expand the workforce of IPG and grow its customer base. Marketing and Products — In September 2015, it acquired Chiefton Supply Co. (“Chiefton”). Chiefton (a) designs, distributes and sells apparel featuring graphic designs; and (b) provides high-level design and branding services to various clients, from grow stores and dispensaries to wholesale cannabis companies. Currently, its apparel sales and consulting are primarily focused on Colorado customers. In early 2016, Chiefton announced the official release of their cannabis design agency website, www.chieftondesign.com. Since inception, Chiefton has built a name for themselves through innovative cannabis graphic design and branding. Initially focusing on the development of their apparel line, they realized the opportunity to provide similar services to fellow organizations within the industry. Consulting and Advisory — In May 2015, it relaunched its consulting business under the tradename Next Big Crop, by hiring individuals with expertise in the cannabis consulting industry, including obtaining licenses, compliance, cultivation, logistical support, facility design and building services. With the existing market and the potential growth if additional states legalize cannabis sales, we see a significant opportunity to bring our expertise to clients seeking to enter or expand within the industry. Currently, we serve clients in Colorado, Hawaii, Maryland and Nevada. Finance and Real Estate — The revenue for this segment currently derives primarily from leasing land it owns to a licensed medical cannabis grower. It also has the ability to grow its Finance and Real Estate segment. In November 2015, it obtained an option to acquire an equity and debt interest in a company that is an industry leader in the production and distribution of a full line of medical cannabis elixirs and edible products in Arizona. CANN is currently trading at a $13.5 million market valuation. The company reported a stellar year and continues to trend higher. Volume breadth and expansion has been impressive. 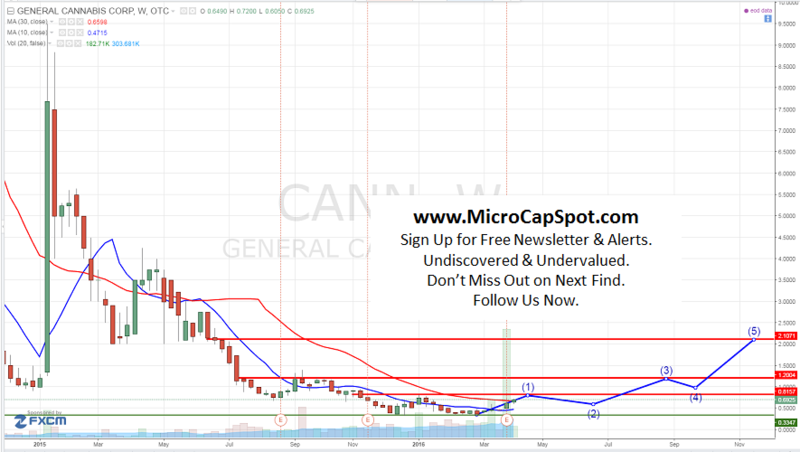 CANN has a 52-week low of $0.32 and a 52-week high of $4.25. If the stock were to reach its 52-week high again it would more than triple from current levels. Disclosure: we hold no position in CANN either long or short at the publication of this article.